Keeping your companion animal’s skin healthy and coat shiny can prove very challenging. There’s more to skin-and-coat health than regular shampooing and daily brushing. Even though the skin is the body’s largest organ, it takes a backseat to other organs when it comes to nutrition. 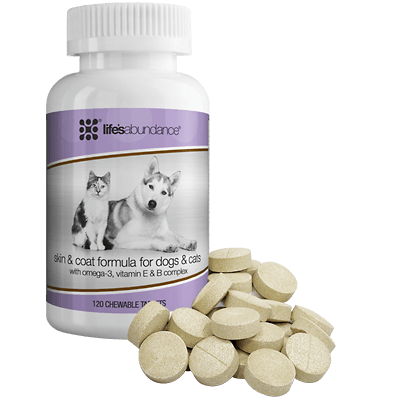 In fact, the nutrients eaten by your pet go directly to the other vital organs first (such as the brain, heart, lungs and liver); as a consequence, the skin often suffers. Even if you are already feeding your companion animal a high-quality, nutritionally dense food, sometimes it’s just not enough to ensure skin and coat health. In fact, problems relating to the skin and coat are much more common than you might think as they account for a significant percentage of trips to the vet. Skin & Coat Formula Can Help! In addition to skin-nourishing omega-3 fatty acids, this formula contains vitamin E and zinc, which help increase the effectiveness of the fatty acids. The vitamin A in this formula helps cells to grow and supports the naturally-occurring layer of oil on the skin, helping to keep it healthy and supple. This formula also contains vitamin C, which supports healthy collagen development. 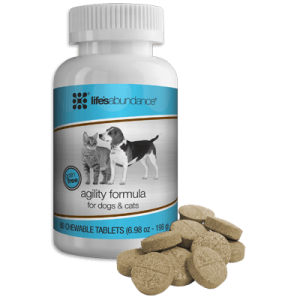 And to top it off, our new and improved Skin & Coat now contains seven different B vitamins (thiamine, riboflavin, d-pantothenic acid, niacin, pyridoxine, B12 and biotin), all of which work with the other nutrients in this formula to aid in the many complex chemical reactions required for healthy skin and coat. If your companion animal’s skin or coat is less than perfect, try a bottle of Skin & Coat Formula with a comprehensive line-up of nutrients that work together to help support healthy skin and a shiny coat.